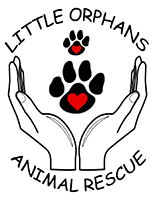 Little Orphan’s mission is to rescue cats and dogs who have been abandoned, neglected, abused or are no longer able to stay in their homes. We provide love, shelter, food, companionship and medical care until permanent placement is secured. We are dedicated to bringing an end to the suffering of those creatures who wish for nothing more than to bring unconditional love and joy to their human companions. With overwhelming numbers of animals euthanized in the United States each year, we are addressing the urgent need for population control by offering a spay/neuter assistance program for the public and conducting TNR.